With K2’s business process application platform, organizations can use visual designers to rapidly build and deploy low-code applications that are agile, scalable and reusable, resulting in modern processes that quickly and easily connect people, data, decisions, and systems. 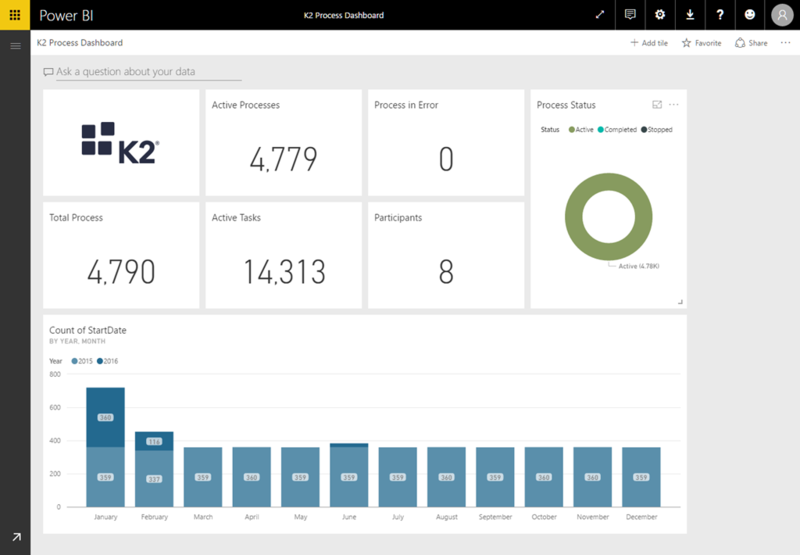 K2’s integration partnership with Microsoft Power BI is an important augment to what K2 has already enabled for reporting natively within the K2 Appit for SharePoint platform. Through this integration, you can intuitively and visually analyze the effectiveness of their workflows and gain actionable insights into key business processes. 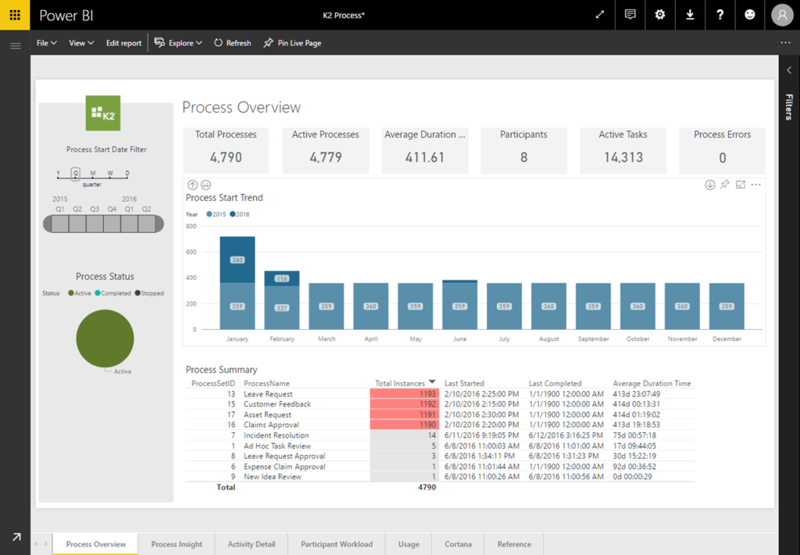 K2 also built a number of Process Analytics Templates for Power BI to provide an easy way to gain access to your K2 data. With these pre-built templates, you can view your process performance instantly. Power BI Online customers can use the Process Analytics Content Pack reports and dashboards for K2 Appit and customize these reports using Power BI’s Online Report creation interface to meet your business needs, pin new reports to your Power BI Online dashboard, and make them available to your colleagues in minutes. 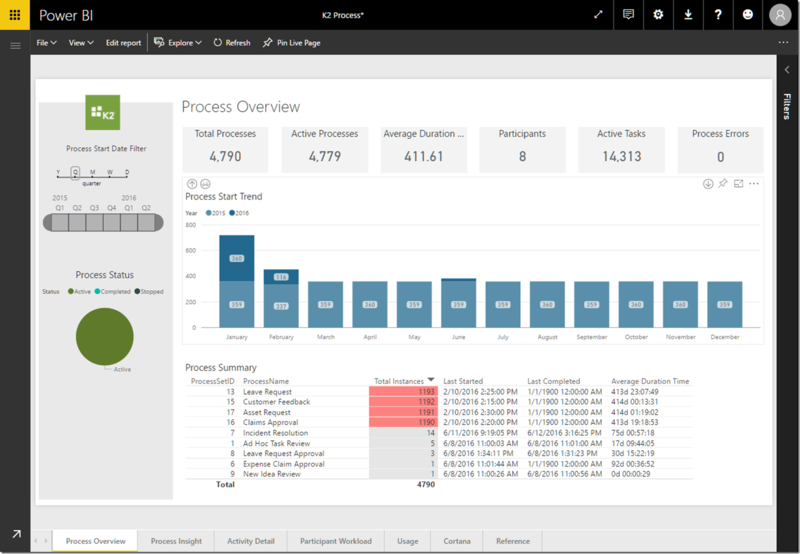 To connect to the K2 Process Analytics content pack, simply choose the K2 content pack in the AppSource Power BI gallery, then click Get it now. All you need to provide is your K2 OData endpoint URL. For more details on how to enable and configure your K2 account to work with Microsoft’s Power BI, please refer to the product documentation here. For a step by step documentation on how to connect to and use the content pack, check the K2 content pack help page. 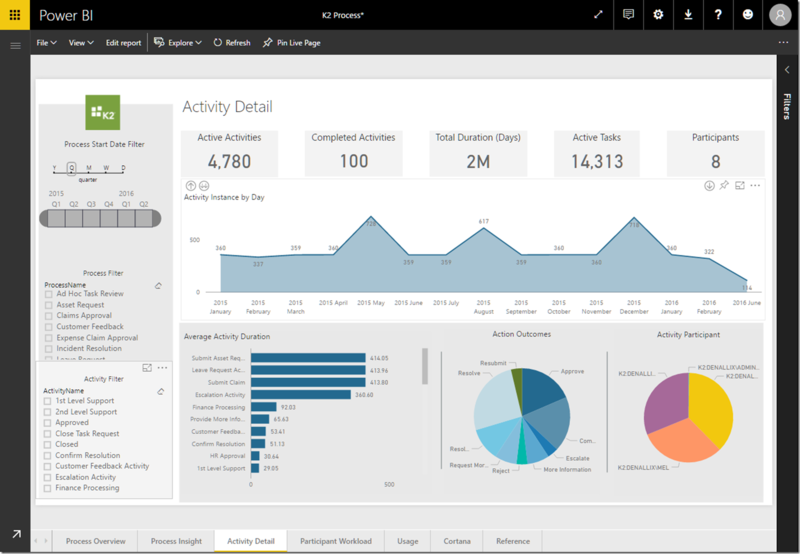 After the content pack finishes loading all your K2 process analytics data, Power BI will create a pre-designed dashboard and a report that you can start using right away to analyze and explore your data. The dashboard shows you key metrics for your active processes, their status, and progress over time. You can click on any of the dashboard visuals to explore the underlying report where you can interact with the data to find answers to your business questions. Power BI reports are interactive. You can use the provided out-of-the-box slicer on the left-hand side to filter your data to the exact period you’d like to explore. Clicking on any of the data points in the charts as well will update the rest of the canvas to show related data to the selected data point. The K2 Process Analytics content pack comes with seven report pages. From Process Overview to Activity and Usage Details, you will find that there is a lot of insights to be gained by exploring your K2 data with the Power BI. The reports created by the content pack are also fully customizable. You can simply click on “Edit report” and personalize it to show exactly which metrics that you care most about. You can also create new reports and dashboard on top of your K2 Process Analytics dataset to fully customize your experience. After the initial import, the dashboard and the reports continue to update daily so you always see up-to-date data. You can control the refresh schedule on the dataset and configure to refresh at the exact times you choose. For more detailed information checkout K2’s blog post.